Democracy is also a deeply rooted Somali political principle which, I suspect, continues much as usual in the more remote parts of the nomadic interior. How long it will be before it reasserts itself in the central political life of the state remains to be seen. The ICG has an excellent new report on the state of the the Kenyan military intervention in Somalia. The slow pace of the military operation and the high cost of keeping troops in the field are the main reasons behind Nairobi’s desire to operate under AMISOM command. The treasury would then not have to pay the full cost of the campaign. It is estimated that Linda Nchi is costing the government at least KSh 210 million ($2.8 million) per month in personnel costs alone in a year of a record KSh 236 billion ($3.1 billion) budget deficit. If the interven- tion’s cost is not contained, already high inflation will spiral, and local discontent could become more serious….. The intervention in Somalia is likely to have a complex impact on Kenyan Somalis’ political positions, because their attitude toward it is not straightforward. The government’s desire to establish a buffer zone between the border and the rest of Somalia privileges the Ogaden, the majority Kenyan-Somali clan. 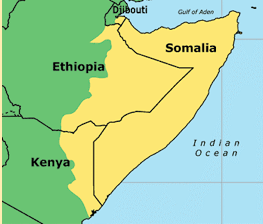 The possibility of a semi-autonomous state in the south of Somalia politically dominated by Ogaden may not be favoured by the minority, marginalised clans of north-eastern Kenya, such as the Ajuran and Degodia…..
Views within the ethnic Somali and wider Muslim community regarding the war are mixed but predominantly critical. Even those now mildly supportive could easily become hostile, especially if things go badly wrong, and civilian deaths mount. The notion that the war is popular within the Muslim community is wishful thinking, and the potential to exacerbate already worrying radicalisation in the country is very real. The police and other security services have shown some restraint in bigger cities, but there have been numerous reports of abuses in North Eastern Province. UPDATE II: John Campbell over at the Council on Foreign Relations discusses the extent of US and French assistance to the Kenyan invasion of al-Shabab controlled regions of Somalia. Check it out here. Middleton makes good points about the Kenyan invasion of al-Shabab-held regions of Somalia. The Ethiopian failure in 2006 and potential for a humanitarian crisis must certainly be part of the cost-benefit analysis on the Kenyan side. Failure to establish a secure buffer zone in Southern/Western Somalia and/or to defeat the al-Shabab will definitely have serious consequences. But the alternative is worse. Al-Shabab elements kidnapped aid workers in Dadaab, in a clear signal that they are willing to disrupt humanitarian aid not only within the areas they control but also within Kenyan. 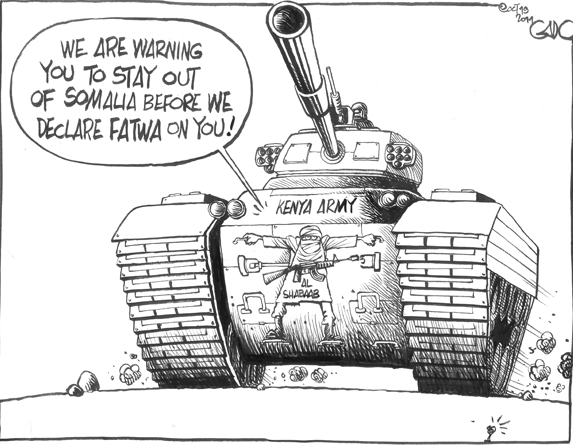 In addition, it is important to appreciate the gravity of the al-Shabab threat to Kenyan security. If al-Shabab is allowed to continue operating within Kenya it may morph into a more dangerous domestic insurgency with a ready supply of disaffected groups – Kenyans in the North East who for decades have been neglected by Nairobi and have legitimate reasons to express those grievances by organizing around such a movement. [It is interesting that neither the Kenyan parliament nor presidency has officially declared war on anyone. It is the internal security and defense ministries that have been running the show]. 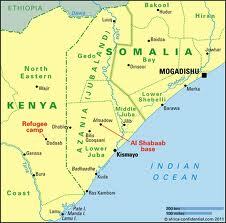 Al-Shabab has been severely weakened around Mogadishu. The ongoing famine has also served to weaken their control of Somalis’ hearts and minds. Their remaining stronghold is the port town of Kismayu whose capture will deprive them of an important supply route and source of revenue (via Indian ocean piracy). If there was ever a good time to try and defeat the group in the battlefield (especially since they have refused to negotiate with anyone), this is it. On Sunday the Kenyan armed forces moved into Western/Southern Somalia. The invasion was occasioned by recent kidnappings of tourists and aid workers near the border with Somalia. Al-Shabab, the proscribed terror group in Somalia, is suspected to have been behind the kidnappings, although it denies the charge. The invasion comes at a difficult time for the country and will no doubt generate significant economic and political consequences. Inflation is at over 17%. The Kenyan Shilling is struggling against the US dollar. And the rate of economic growth appears to have slowed from a projected annualized rate of 5.6%. The increase in military expenditure amid high inflation, a severely weakened Shilling and calls for fiscal austerity will surely have a negative impact on future growth prospects. For more on this check out the Business Daily. On the political side, success in routing al-Shabab will be another feather in retiring President Kibaki’s hat. Failure might ignite a backlash against the country’s military establishment. It will be interesting to see how the political class deals with failure, since this is the first time that Kenya has ever undertaken a military operation of this scale. My take is that the military, as an institution, will take the fall in case of failure. Because of their ethnicized nature, previous lapses in security in the borders with Ethiopia and Uganda did not create that many problems for the pols in Nairobi. That said, this time might be different because of the nature and scale of the threat. Of interest will also be how this military operation affects civilian control of the military. Experience in many less institutionalized countries shows that heightened militarization results in diminished civilian control of the military – with the potential for coups. I doubt this will be the case in Kenya. However long “Operation Linda Nchi” takes the result will be closer to the Tanzanian invasion of Uganda in the late seventies than to cases where military adventurism resulted in the overthrow of an incumbent (like in Siad Barre’s Somalia). Civilian control of the military in Kenya remains stronger than in most African countries. Beyond matters of civilian control of the military it is important to consider what the repercussions will be for ordinary Kenyans. 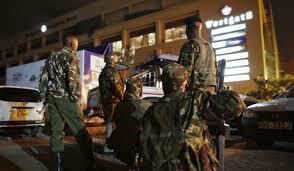 Many fear that the al-Shabab might strike Kenya where it hurts most – in Nairobi. This is a real possibility that one hopes the Kenyan government has planned for. Also, in the event of a protracted war or a major terrorist attack by al-Shabab within Kenya there is the possibility of a backlash against Kenyans of Somali extraction. While this might happen among the masses I doubt that any of the major political figures will actively promote such a misguided reaction. North Eastern Kenya is an important voting bloc that the presidential front-runners in next year’s general election will want on their side (Mr. Odinga, the Kenyan Prime Minister is particular keen on this voting bloc). In this regard the fact that blatant scapegoating of Somalis will have negative political consequences is a source of mild comfort. 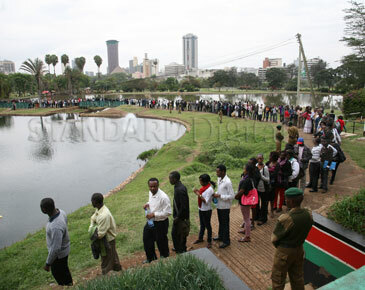 Kenya’s foreign policy has at best been mild and at worst meek. The nation has been out of the regional combats even when incursions took place in its territory, opting for peaceful resolutions. This has happened in the Kenya-Ethiopia border during the Oromo wars and during the Ogaden War when Kenya opted for peace parleys rather than battlefield tussles. But this dud non-aligned policy of the 1960s, exacerbated by the extinguished Cold War, holds no place in the current political order where terrorism and banditry has replaced conventional wars. There were few options left for Kenya. 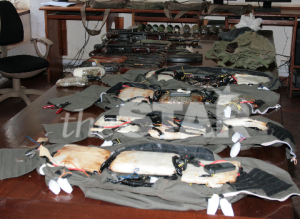 One, they cannot let the al-Shabaab militia group continue to with their raids oblivious of our military power. Secondly, the sovereignty of our nation, and our pride was undergoing severe test. The al-Shabab extremism must come to an end.